In the age of interactive media, consumers now expect to be able to take action and control things in many situations. This is especially true when it comes to targeted information procurement. Meet your customers or guests by using a touchscreen kiosk! As visually more impressive alternatives to information terminals, steles automatically attract the attention of those present. These can retrieve information independently or, for example, display the layout of the building during the course of the journey. This gives the operator a positive impression, which he associates with your name. We at friendlyway design and produce digital steles and other presentation systems, which act as a point of view and directly address your target group. In the case of the touchscreen kiosk, you provide (potential) customers or visitors with an interactive interface and invite them to deal more closely with your offer. Our portfolio includes both small versions with 10 inch screens as well as XL steles of two meters in height with 46 inch industrial screens. In this way, you can select the most suitable model according to the requirements of your premises, which we can also adapt to your corporate design on request. You can get software for the touchscreen stele right away! It goes without saying that a touchscreen kiosk only works with a dedicated software developed for this purpose. As a full-service provider for presentation and display systems, friendlyway also provides you with competent support in this matter: We provide you with a tailor-made touchscreen software, which guarantees a smooth and intuitive operation. Here, as with the production of our steles, we are geared to your individual requirements. If necessary, we also manufacture special equipment to ensure a positive user experience of your customers or guests. We have been active on the international market for many years. Customers from a wide range of industries such as gastronomy, automotive and real estate rely on our services. 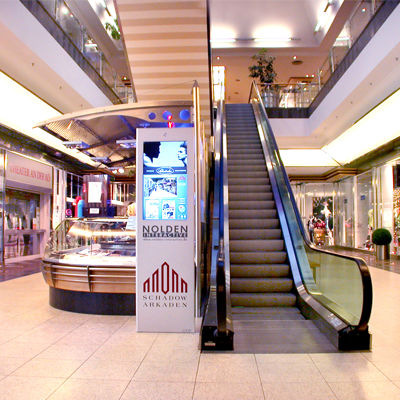 Depending on the area of application, advertising displays, info kiosk or internet terminals are used. Decide for superior advertising and communication technology to gain the attention of your target group and to consolidate their commitment to your brand!